UPDATE: It appears that the post I originally referred to here has been taken down. The Wayback Machine does not have anything on it, regrettably, so you’ll have to rely on my quotes as representative. The author has put up another post about the coverage the original post received from the local media here. Handily summarised for you in blog post form by an Ipswich councillor. This is not a parody. This is really someone who writes a blog post entitled ‘Why I don’t listen to experts (or facts and figures)’ and means it. I know what you’re thinking. No-one could possibly be that arrogant as to assume they know absolutely everything. You’d be wrong. Apparently, your ‘gut instinct’ can tell you how to look after a child, assess the state of the global climate, comprehensively assess the state of the economy, fail to predict the next Conservative leader, and predict when your roof will fly off. But it can’t tell you that the so-called ‘TV interviews’ were actually called ‘debates’. Apparently, confirmation bias is a good thing. Not analysing your own assumptions because they make you happy is a good thing. Anything that makes you unhappy you don’t have to believe, because your gut instinct tells you it’s wrong. You intuitively know how to be a parent, which is why everyone is great at looking after children and no-one is ever messed up by bad parenting. It is possible to adequately assess the global climate using observations taken only from Ipswich. The credit risk associated with several people you know who have credit cards is directly correlated with the state of the global banking system. You know that opposition politicians sometimes try to put their case across in an underhand way. You don’t understand why citing someone who lost an election as ‘more approachable’ does not bolster your argument. It is possible to assess the exact direction and strength of a gust of wind twenty four hours before it happens. Actually, I wish this were true, as it’d be very handy for operating the electricity grid. Because there is debate in elite discourse, we should reject it. Because often a matter is not settled, we should reject disputation and scholarship as routes to the truth. Because expert opinion differs, it cannot be relied on. Statistics lie, and the only way of accessing the truth is through one’s own intuition. No. We should listen to experts precisely because they disagree, because they are engaged in an iterative process of trying to get at the truth. We should listen more to experts who change their view when new evidence comes to light, because fundamentally knowledge is about what is real, rather than what we’d prefer to be real. It is this: the valuing of a preferred reality, enabled by a media that aims to serve palatable news product and tame ‘experts’ who never deviate from a single ideological position, which is what is wrong with Britain today. We did not become a great country by wallowing in a reality we constructed to please us, and we will not remain a great country if the kind of hopelessly arrogant thinking outlined above is not challenged. I understand the need to raise revenue, I really do. 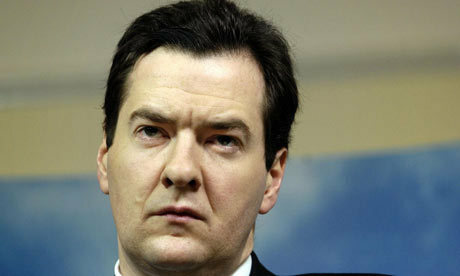 I understand that Osborne thinks a VAT rise is less damaging than an income tax rise. What I don’t understand is why he”d implement a policy that he knows will lower retail sales when retail sales are already decreasing. An export and manufacturing-led recovery can only go so far, especially when you’re simultaneously cutting support for, say, the marine energy industry. I don’t understand why Cameron, with his project of detoxifying the Tory brand proving really rather tricky, allowed Osborne to go for a policy that smacks of Thatcher. Sorry, that should be ‘smacks people about like Thatcher’. It’s possible that this in fact a canny strategic move, preventing Labour from arguing about the balance of taxation and spending cuts that comprise our deficit reduction strategy. Indeed, after Milliband’s complaints today, it will prove difficult for him to argue that taxes should be raised in place of other cuts. However, I’m more inclined to chalk this one up to yet another instance of over-hasty decision-making. If Osborne really must tax something, how about land values? Assuming we simultaneously reform planning, of course. …for property, that is, and it’s one that’s illustrated by his 10-minute rule bill that’s he’s speaking to as I write this. The idea is that the law should be changed to prevent banks from lending out any money you deposit with them without your consent, as legally when you deposit any funds they become the bank’s money. This means that banks can lend out your money even if they don’t have enough money to pay you back. Under Carswell’s scheme, this would be changed to banks being required to ask you if they could lend out your money, and otherwise merely holding on deposit until you collect it. This notion is called ‘honest money’ and is derived from the work of the Cobden Centre, a libertarian think-tank. And it stands in astonishing contradiction to the rest of libertarian thought; which revolves around the idea that the private sector always knows best and that Government should stay out the interests of private concerns as much as possible. This is a clear state intervention in the banking market, ostensibly on the side of the little guy who’s being taken advantage of by these terrible, terrible banks. The problem is that banks are a business. They do what they do for profit. Under Carswell’s scheme, say you’re on Jobseeker’s Allowance and are receiving £60 per week. Thanks to the largely free banking system we have in this country, you could immediately deposit that in a bank without incurring any cost. However, under Carswell’s scheme, the bank would incur a cost for taking your money (staff time, processing etc.) but be unable to make a profit on it unless you consented to allow them to lend it out. Why on earth, in that case, would the bank want to handle your money? They’d either charge you a handling fee or simply refuse to take deposits from those who want to retain full rights over their money. In practice, therefore, the £60 would become perhaps £58 per week, unless you gave up your property rights in a way which seems anathema to Carswell. The upshot is that the little guy would be in the same situation as he is now, as the least well-off can’t afford a handling fee for the use of banks. They’d either be excluded from the financial system altogether or give up their rights. This is a logical consequence of banks being profit-making entities. This bill seems to be the result of the fetishisation of property rights – the near-worship of property itself – to the point where they overwhelm the interests of the least well-off. But as I’ve said before, that’s what libertarianism is all about.